My seminar met at the park today to discuss the historical background and cultural implications of the American lawn. 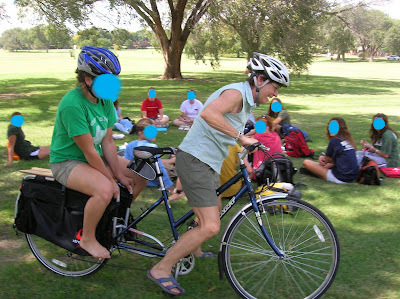 One of the students has a broken foot, so I was going to try to carry her on the Xtracycle when I sent them all out on their bicycles for the sketching portion of the class. I thought I'd try it first with a non-broken-footed student to see how difficult it was going to be. The look on the student's face should give you a clue...oh wait, I've redacted the faces of the students. Trust me, she does not look like she has confidence in my skillz. In the end, we decided it probably wasn't a good idea to carry someone with who already had a broken bone--no sense in breaking more. She drove her car.